Guide removes trap for mountain gorillas, which will save a gorilla from poaching and the wildlife trade. Pressure caused by in-country fighting has large impacts on communities, but what about the animals caught in the crosshairs? Some of the world’s most endangered species reside in areas of the globe plagued by critical human rights issues. It can be hard for governments to focus on conservation and habitat protection in the midst of political instability caused by civil wars or coups. Even harder to ignore is the welfare of citizens and refugees, which are often compromised by political change and violence. How can governments be expected to put effort into conservation when human lives are at risk? This difficult question can be answered quite simply; conservation not only benefits wildlife, but also improves the day-to-day lives of people. In many cases, human livelihoods and conservation are connected. With improved conservation, the tourism industry can grow, bringing money into areas near national parks and protected areas that can be used to stimulate the economy and development. Tacugama Chimpanzee Sanctuary, a PASA member in Sierra Leone, is a great example of a sanctuary that supports the wellbeing of local people. 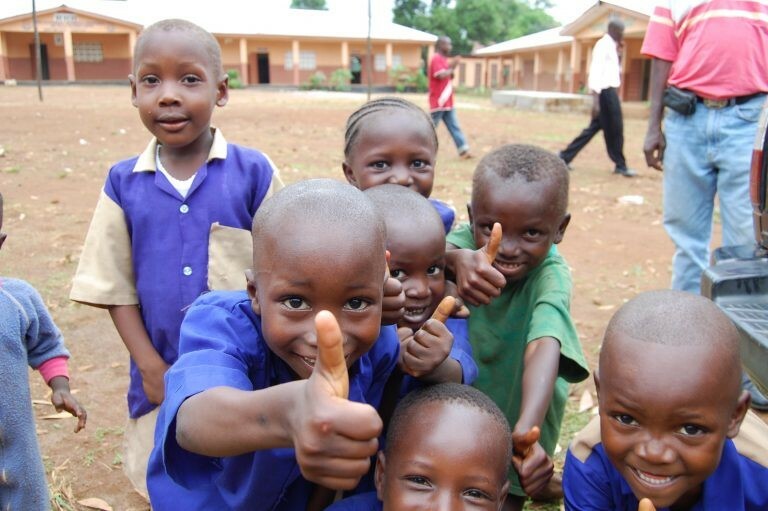 Tacugama has many programs focused on natural resource management, providing people with alternative livelihoods to poaching, and constructing community latrines to increase sanitation and fight disease spread. Sanctuaries that place value on the economy and development of their community create an atmosphere where conservation is not only possible, but achievable. 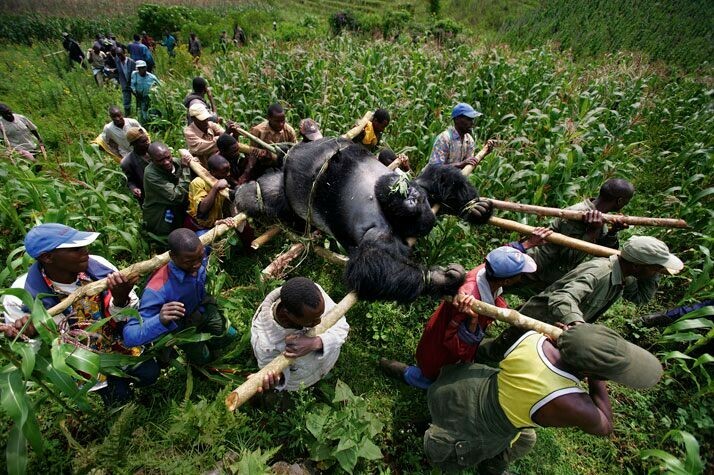 Grieving villagers carry a silverback mountain gorilla killed by rebels. The interconnected lives of people and primates was explored in the film Virunga (2014), which uncovers an elaborate conflict involving local people, endangered gorillas, protected land, natural resource extraction and political violence. The film shows the importance of the Virunga National Park for the conservation of the last mountain gorilla population on Earth and for the people of the Democratic Republic of the Congo reliant on tourism for money. During the time the documentary was filmed, rebel groups in the D.R.C. invaded areas near the national park, aiming to undermine the park and allow oil companies a chance at exploiting natural resources deep within the park. In this instance, the lives of rangers, locals, and endangered apes were compromised due to political instability. Since the film, Virunga has survived more violent turmoil, and has remained devoted to the safety of locals, tourists, and of their precious mountain gorillas. With that goal in mind, the park has been closed to tourists for the remainder of the year in hopes of securing the park from the surrounding instability. The rangers working so hard to keep the park running believe tourism is crucial for the welfare of people in the area, going as far to say that Virunga is their best chance to improve people’s wellbeing. Governments that fail to ensure stability are often unable to properly enforce laws because their focus is on maintaining political control. Illegal activities of rebels have been linked to increased levels of poaching and trading of endangered species, making the very existence of rebel political groups bad news for already threatened animals. Furthermore, the exploitation of protected animals by local people increases during times of conflict, whether because people rely more heavily on poached meat for subsistence or are selling animals to profit themselves. These factors place an enormous amount of pressure on local sanctuaries of the area since they are the ones caring for any animals left orphaned in the aftermath. Specifically, in the DRC there are three PASA member sanctuaries: J.A.C.K. Sanctuary, Lwiro Primates, and Lola Ya Bonobo. These sanctuaries must work through any difficulties posed by surrounding instability, while PASA is ready to support them in any way possible. Violence and political instability leave lasting effects on the survivors for many generations and at some point, it becomes difficult to imagine stability and peace. But, there is hope for peace. When governments and people choose to protect their wildlife, they are making an investment in the future of their country. And, when the fighting ceases, people and animals alike will see the benefits. Tacugama Chimpanzee Sanctuary holds community days on public holidays, during which locals have free access to the sanctuary for tours and wildlife education. Sanctuaries are actively fighting against illegal activities harming wildlife. 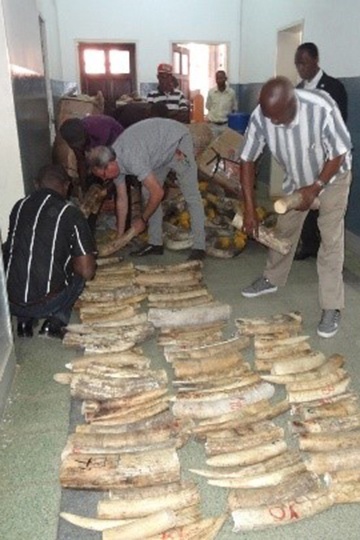 In 2016, J.A.C.K Sanctuary helped the DRC government confiscate 200 kg of ivory that was being smuggled out of the country. 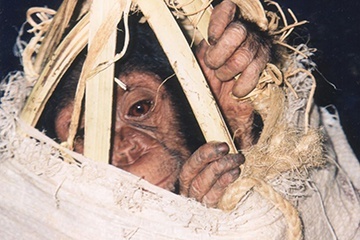 This baby chimp was a victim of the illegal wildlife trade, a black-market industry that increases in times of war.